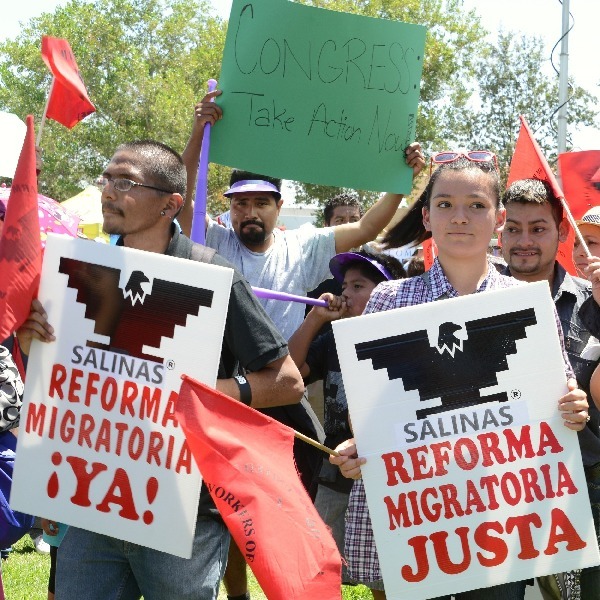 The grassroots campaign for comprehensive immigration reform ramped up in California during the Congressional recess with bus and car caravans to Bakersfield to urge Congressman Kevin McCarthy to support a vote in the House on a path to citizenship. Thousands of people travelled from all over the state of California on August 14, 2013 to press Congressman Kevin McCarthy, Majority Whip from Bakersfield, to support a vote in the House of Representatives on a pathway to citizenship for 11 million undocumented immigrants. Immigrant rights organizers assigned their march security personnel to form a human barrier between immigrant rights and immigration reform opponents while Bakersfield police stood by and did nothing. Despite some heated arguments, peace was maintained. Leading organizations behind the caravans include the Coalition for Humane Immigrant Rights of Los Angeles (CHIRLA), the California Table, the United Farm Workers (UFW), Services Immigrant Rights and Education Network (SIREN), and the Los Angeles County Federation of Labor. Dozens of individual labor unions and community organizations mobilized hundreds of buses and cars to bring supporters to Congressman McCarthy's office on a Wednesday morning. Eliseo Medina, secretary-treasurer of SEIU explained, “We’re here to tell Congressman McCarthy that the time is now to reform our broken immigration system and provide a path to citizenship for 11 million aspiring Americans. While the U.S. Senate has already passed its version of bipartisan Comprehensive Immigration Reform in S. 744, one of the bill’s most serious shortcomings is that the excepted wait time to citizenship for undocumented immigrations in good standing will be a minimum of 13 years, and subject to the achievement of a number of border enforcement thresholds or “triggers” prior to completing the legalization process. This will be in addition to the 10, 15, or 20 years many people have already been waiting in the shadows. Republican control of the House makes it likely that the House version of immigration reform will be even less favorable in various respects. This political reality puts demands for a humane waiting period for citizenship on the back burner. It also fails to address any pathway to legalization for some 3-4 million of the 11 million undocumented immigrants in the United States. Final passage of comprehensive immigration reform will be a milestone which will provide humane relief to the majority of undocumented immigrants currently in the country. It will allow them to come out of the shadows, fully participate and contribute to society, shed their fears, and assert their human rights. While passage of comprehensive immigration reform will enable President Barack Obama and Congress to add a major accomplishment to their historical legacies, a lengthy and tortuous pathway to citizenship will still leave much to be desired. The demand for bringing any kind of comprehensive immigration reform to a vote in the House is not enough. The need is for a humane pathway to citizenship for all but serious criminals, visa quotas that truly meet the nation’s economic needs, and broader not reduced provisions for family reunification. Meanwhile other caravans are shuttling across the state to mobilize for another convergence in Bakersfield on September 2, 2013. At a press conference on August 13 in San José, Father Jon Pedigo, a leader of People Acting in Community Together (PACT), said the coastside leg of the caravan from San José to San Luis Obispo (one of three) will “tour to hear these stories from immigrant families, business owners, Democrats and Republicans” about why “our immigration system is broken and unsustainable.”These caravans are among hundreds of actions across the nation during the August congressional recess escalating the pressure for comprehensive immigration reform with a humane pathway to citizenship. 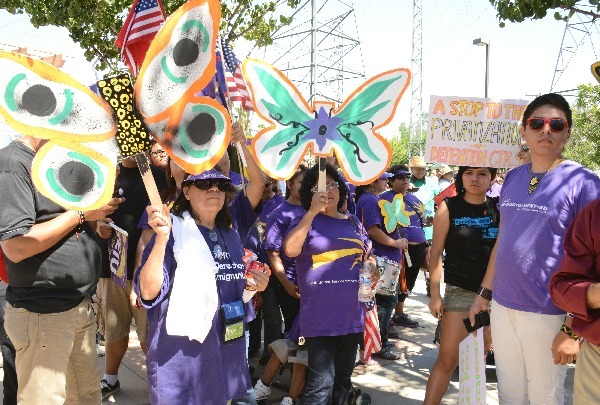 Immigrant rights activists entering the office of Congressman Kevin McCarthy in Bakersfield on August 14, 2013 to urge a vote on a path to citizenship. Dream activists at rally in Yokuts Park telling about their aspirations for fully contributing to society and for their parents to come out of the shadows. 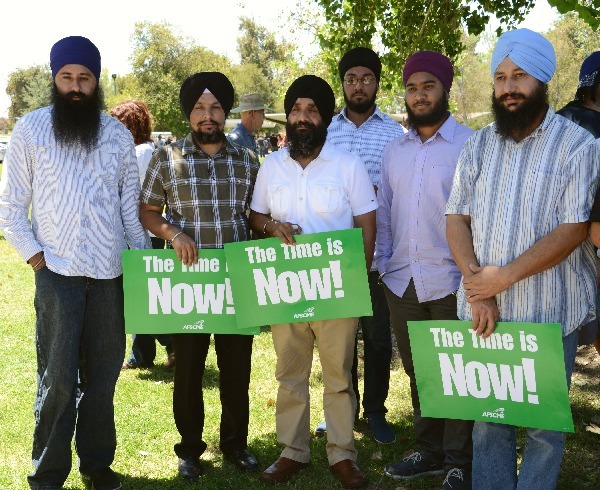 Sikhs, who have played an important role in the Central Valley economy for a century, show their support for comprehensive immigration reform now. 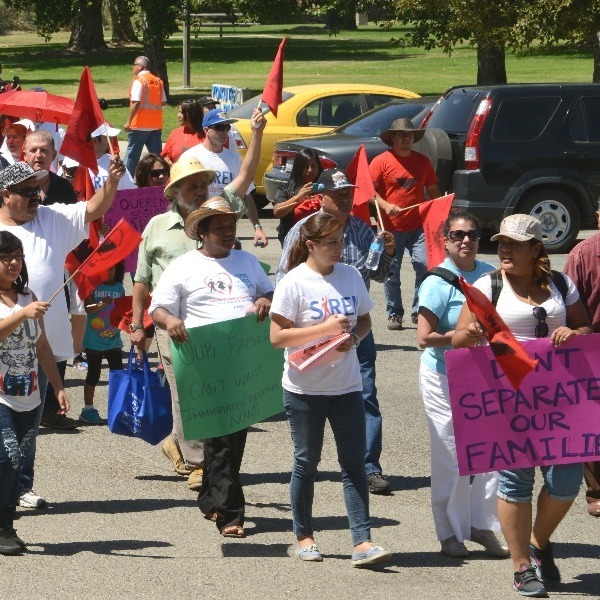 Caravanistas marching to the rally in Yokuts Park. 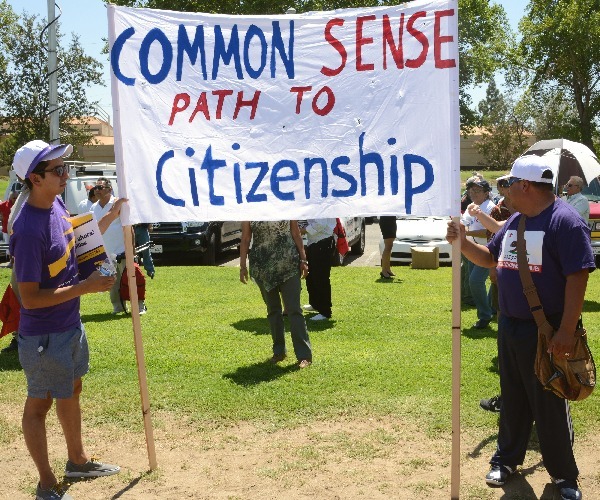 Immigration activists calling for a “common sense path to citizenship” for 11 million undocumented immigrants. 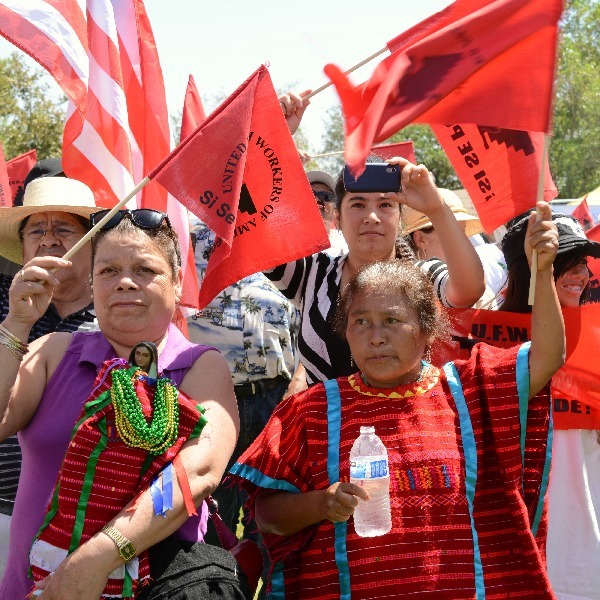 Farmworkers, members of the UFW, rallying for a pathway to citizenship at Yokuts Park. 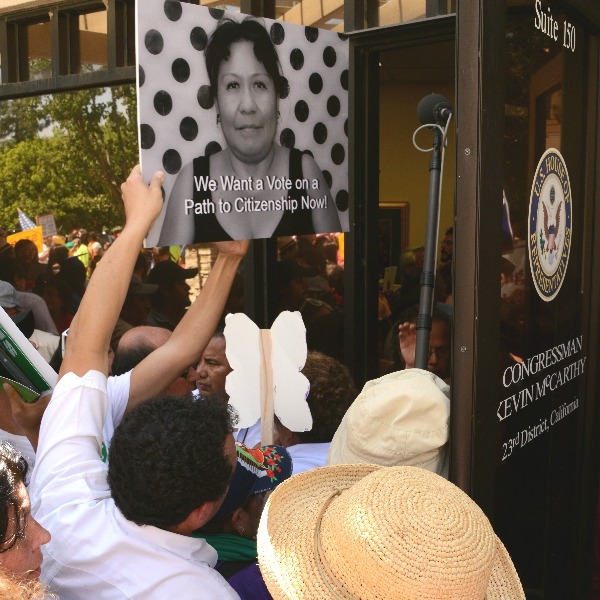 Demonstrators carrying butterfly posters in front of Congressman Kevin McCarthy’s office, suggesting that migration is a right. 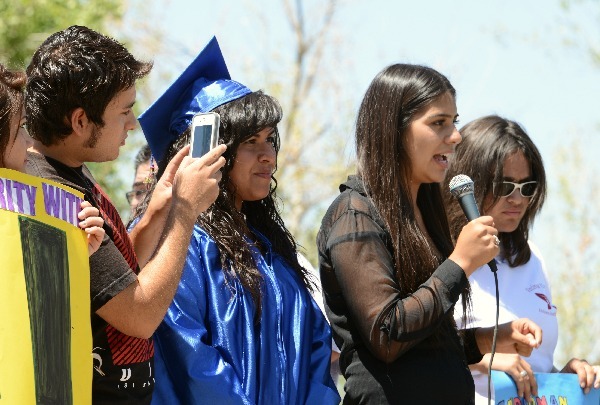 Many youths openly declared that they were undocumented. Security volunteers (in yellow shirts) for the immigration reform march formed a human barrier separating pro- and anti-immigration reform protesters. 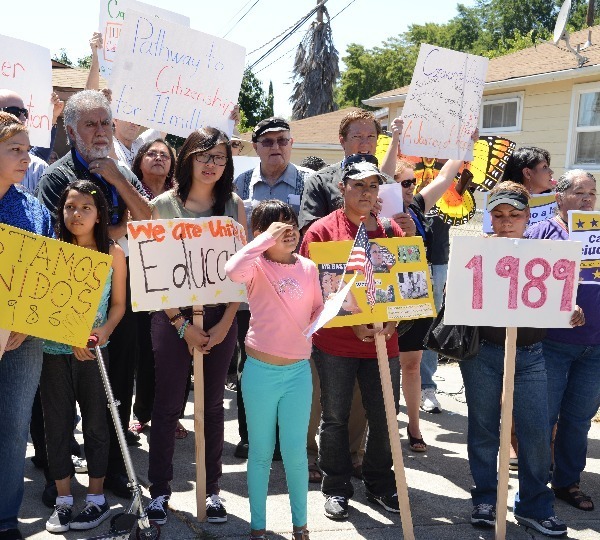 Rally to kick off another immigration reform caravan in front of the former home of César Chávez in San José on August 13, 2013.